Shadow Warrior, Gone Home, Europa Universalis IV and more come back for another round of discounts. 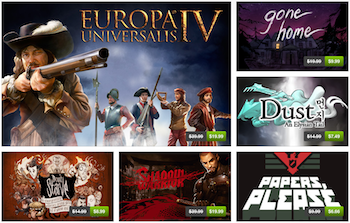 Two weeks ago, the newly-opened Humble Store started its Winter Sale. Like most sales, it allowed you to transmute your hard-earned currency into electronic delight with surprising rates of return. Unlike most sales, portions of the proceeds go towards charity. The time has come for the Winter Sale to wind down, but before it fades into the dawn of 2014, its biggest sales are coming back for a 72 hour encore. A few notable returns are Gone Home at 66% off, and Shadow Warrior, Dust: An Elysian Tail, and Guacamelee for 75% off. You can also bag the grand strategy sim Europa Universalis IV for 75% off, but only within the first 24 hours, so don't dawdle. You can even grab Monaco for 80% off, which is a steal. Even if you've already taken advantage of the above offers, there will be plenty more to find scattered throughout the Humble Store. After that, the prices go back to normal, but that's ok, because you'll more than likely be snuggled under a pile of fresh new games. If you're like any other PC gamer, you likely have enough unplayed games insulating you to easily stave off the cold until the next big sale event in 2014.